With parents living in Tampa, this is a great port for us making it easy and convenient to get to and from the port. We embarked late intentionally avoiding having to wait to board. That plan paid off and we were through security and onboard in 20 minutes after arrival. We traveled once again on Rotterdam one year after the "drydock" cruise. We were offered a fairly generous incentive after some issues the previous year. So we decided to try again, and this time the ship was in much better shape. Holland tends to attract a more mature group of people which could be good or bad depending on your circumstances. We prefer a more quiet cruise without competing with families and children in the common areas. If we wanted to travel with our children or grandchildren we would not choose Rotterdam, but probably a newer Holland ship with more offerings appealing to families. Even though Rotterdam is an older ship, it&apos;s in pretty good shape. We liked all dining options and made dining choices based upon the daily menu or our mood. Lido is still great for quick breakfasts, lunches or dinners and offers a good place to meet up with new friends. You can find just about anything in the Lido with all of the options and choices would be similar to what you might see in a diner. The Lido is a large scale operation and I think the staff does very well considering the high number of people being served each meal. The Main Dining room offers served meals and menu options are posted outside the doors well before dinner. We like to go to the Canneletto and Pinnacle at least a few times during our cruises and find the food to be very good at both. The modest additional cost is well worth it. One of the best values is dining at Pinnacle for lunch. The staff and service in all of the dining areas was excellent. This was a pretty laid back trip for us and we only did three excursions this time. One excursion was through Holland and the other two were private excursions. I would choose a ship excursion for a short port day eliminating any worries about getting back in time. There were some great happy hour type events that we enjoyed and met up with others after returning from excursions. It was a surprise to be served some nice appetizers during these happy hour specials. We had a minor incident with our room, but it was promptly addressed. We were offered a letter of apology for the inconvenience and were given a complementary meal in Canaletto. We chose our room in advance on the Promenade level so that we had quick access to the deck for walking. The Promenade deck on Rotterdam is quite wide allowing many people to walk at the same time. The Fitness Center has good programs and the equipment and space is well appointed. If I had to point to areas of improvement, it would be Entertainment and Enrichment, and this would mirror other reviewers. We&apos;ve been to so many Microsoft Windows and America&apos;s Test Kitchen classes in the past, so there seemed less for us to do. I think more daytime enrichment is needed especially during sea days. If you are the type looking for endless excitement and things to do, I don&apos;t think this was the ship for that. However, when talking to other people, they did comment positively on stage shows, bar entertainment and dancing. I think you can make your own fun wherever you go. Most people we met were on the ship to relax, and that is what we were there for. Upon arrival in Tampa, we didn&apos;t make arrangements for any transfers, but there was no need for worry. There were several offerings for reasonable prices. We grabbed Super Shuttle at the last minute for a great price. For us, Rotterdam and the itinerary offered a pretty good balance, and the ship size is just right. We would travel on the Rotterdam again based upon this experience. 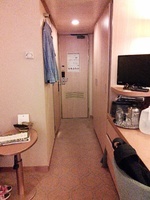 This cabin is aft of the last double doors that exit to the Promenade. In November of 2017 we were forward of this cabin in 3404. If I had to choose again, I would choose 3404 over 3420. 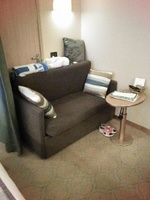 They are the same room and size and convenient to the Promenade deck which we like. There were a few very minor things that we experienced in 3420. Once in a great while, and seemingly when the sea was a little rough, the room would literally sound like the walls were cracking. But, this was not consistently; just occasionally. We could also feel the propellers in this room, but again, it was not something that would drive you crazy or would make you want to change rooms. It was just different than 3404. 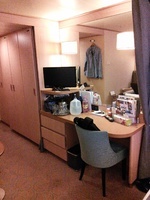 This particular stateroom hall tends to be pretty quiet. The room is obstructed by the steel hull, but you can see the sea if you stand on either side of the bed. 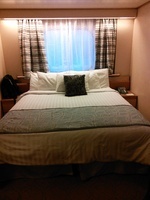 Having a few of the sea was not our goal, but having natural light was, and that was provided with this room. 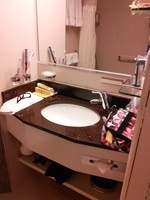 This room has a shower tub combo at this writing, which my husband likes. I did not like the small TV which was hard to watch from the bed. You certainly cannot read any of the movie credits or streaming banner across the bottom. So, HAL went cheap on these small TVs. There is plenty of room for clothes by utilizing the closets, drawers and putting all empty luggage under the bed. There is NO REFRIGERATOR so you have to use ice if you want to have a chilled drink in your stateroom. Friends had an exterior room on Deck 1 Dolphin that had full sea view through a good size window and the room was bigger than ours with a full size sofa. We had a loveseat. So, if you want a bigger room, try Dolphin deck. For 5.5 hours we drove all over the island. We went to the Devil&apos;s Bridge, The National Parks of Shirley&apos;s Heights and Nelson&apos;s Dockyards plus all kinds of photo ops with beautiful views. We paid around $125 for 2 people. We had six in our air-conditioned van which was a good number. If we had 8, the price per person would be less. We had plenty of time to do our excursion and get back to the ship. Emelda is a local who has been in this business for quite awhile. Her van is in excellent condition and her knowledge of the island is extensive. My favorite was probably Nelson&apos;s Dockyard. I would recommend Emelda for a tour in Antigua. Aruba is always busy and congested. I suggest a beach day and get away from the main area and cruisers. There is a mall about 1/2 mile from the ship and they have good wifi. Shopping and bars are everywhere. It was very hot so we got off the ship early and returned early. This was a very short port day so choose your excursion wisely and be aware of the time. This time we were parked right near the floating bridge which was super convenient. I was really surprised when our big ship went into the narrow channel to park, and made a 180 degree to park. We needed WIFI right away so we walked to Pizza Hut and acquired a strong signal sitting outside on the benches. The pizza hut is located on the port parking side in the central square area before you walk over the floating bridge. We went off the ship twice. The second time we went to the Curacao Maritime Museum. This was across the bridge and to the left. From the ship it&apos;s about 15 minutes. It&apos;s pretty much across the channel from the fish market. You walk over a small bridge. The cost was $3 USD PP. Watch the 10 minute film first. The museum is very interesting and I would recommend about an hour here. Walk to the markets and see the fish and fresh fruits and vegetables. The city if very colorful and great for pictures. Go to the fort also and walk up the stairs to get a great view of the city, channel and ocean. We went off the ship again at night to see the lights. This was the best excursion experience. I had been reading reviews of Stingray City for a number of years and decided literally at the last minute to go for it. It was fun and memorable. Our excursion was late getting back to the ship because one of the engines did not start. In this case, I was glad that I took a ship excursion because we were one hour late to the last tender, but they obviously waited for us. There are lots of youtube vids online to view. You don&apos;t have to swim with the stingrays and can choose to sit on the very large boat and watch. You can literally stand in the water at this sandbar. You don&apos;t need to bring a snorkel, but bring your towel, and you can wash off in their on board shower from the salt water. Then sit down and have a beer, soda or water and snack. This time the cruise ship was parked in the Navy yard which was not inconvenient. You will be dropped right in the heart of Key West about 10 minutes from the navy yard. You cannot walk to town due to being on the military base. It has usually been hot each time we have been in Key West. We took the Duval Bus Loop for free and it drops you off at any one of 20 stops. It would be slightly better to take the free bus than walking, but only slightly because the loop bus only really runs about every 1/2 hour vs 15 minutes. But, it was air-conditioned. I suggest going to the most southern point in the Continental US and don&apos;t miss the cemetery. If you do a sail and snorkel you might consider the ship&apos;s excursion only because you will cut it close. The last shuttle to the ship would like ly be very close to the time that you have to be getting the final shuttle. However, I do recommend a catamaran and snorkel. Also, hit the oldest bar in Key West just to say you were there. Walking around KW is very interesting with it&apos;s old architecture. So much to do here. Try to plan in advance so you can hit the ground running. You can get good WIFI at Starbucks which is at the drop off for the free shuttle. CVS is also across the street for last minute items that you forgot or need. You will be conveniently docked right in the heart of Old San Juan. Walk off the ship and go left about a block down the street and then start walking up the gradual incline to San Cristobal first. It is walkable if you are in at least somewhat good condition. The streets are cobbled so if you have ambulatory issues, take a tour. If you have a National Park Pass, bring it so that you get in for free at both forts. I&apos;d say spend about 2 hours at San Cristobal and make sure to watch the free film. The pictures from here are awesome. Next, if you are able walk from the back side of San Cristobal to San Felipe del Morro. Again, you will get in if you bring your National Park Pass. The walk is about a mile or less, but the views are beautiful. We walked into a small bar that sold cans of soda for $2 USD just to cool off. We did not intend to go to Morro because we had been there before, but we wanted to go to the cemetery which was beautiful and uniquely different. DO NOT TAKE THE FREE SHUTTLE. You can walk faster than the shuttle and you have a wait at least 1/2 hour fot it. If you have service grab a LYFT for about $3 USD back to the ship. There is a lot of traffic and OSJ has very narrow streets. You can find anything you may want right in town. You can easily find WIFI. Starbucks is on the walk to San Cristobal. It was hot. Cruising the Pitons was the best part for us. We got a private driver right as you walk through the gates out of the port. We paid $25 PP USD for 2 hours. You don&apos;t have to worry about getting back to the ship and you have plenty of time. The driver took us to all of the overlooks we wanted and gave us his narrative of the island. It was a lot of fun. If you know what you want to do, you can tell the driver. If you want to get a ride to one of the beaches, or to the historic sites (some are closed from the hurricane), or just around the island. It&apos;s your two hours to do what you wish. The Port of Tampa is not that far from the airport and you can get an easy transfer right at the Port upon disembarkation for about $25. Don&apos;t bother with the cruiseship transfer. Holland had a poor berth position this time in #5 which has nothing nearby except the parking lot for cruisers. Many times our cruises came in on Sundays and there is nothing much to do in Tampa on a Sunday near the port. Plan on getting to or from the ship and that&apos;s about it. The Port building had good wifi if you are waiting for Embarkation.